8 YRS Anping County Baiyi Metal Wire Mesh Products Co., Ltd.
2)The molded clips are strong and easy to use,with 5 clips for wide polytape,9 clips for rope, wire,and narrow polytape. 3)The rugged,UV resistant,H beam post has a 7" metal spike,with 2 stabilizing ground spurs on step bottom. 4)The stirrup design makes for easy installation with your foot directly over the pointed spike. 15 It can last more than 10 years, during which time it wouldn&rsquo;t rust and lost print. About the big ones, for examples, rosettes and pickets we put in iron pallets directly. We can booking space for customer or customer find freight forwarder is ok too. Warranty Conditions: 1. This warranty is valid from the date of receiving equipments. 4. This warranty does not apply to damage or deterioration, which is caused by human. 6. Beyond the warranty period, we provide spare parts to customers at factory cost. 7 YRS Shenyang Win Star Plastic Co., Ltd.
Brief Introduction of plastic street posts Win Star plastic posts are totally made of our own Extreplas recycled plastic lumber. And they will remain as good and new as just installed in its whole long life, even after years of strong sunshine and rainy environments. And plastic lumber is the perfect material to make outdoor cable stands, as we all know, plastic is totally waterproof and insulated. 14 YRS Shijiazhuang S D Company Ltd. 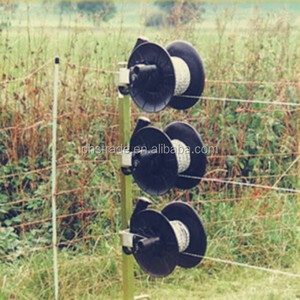 Rugged and easy to drive into any terrain, this T Post is suitable for both agricultural and lawn and garden fencing. Experienced staffs will answer all your questions in professional and fluent English. Exclusive & unique solution can be provided by our well-trained and professional engineers. 5 YRS Weifang Pengxiang Metal Components Technology Co., Ltd.
 5.The two stage arm design is suitable for different kinds of vehicle chassis. Yes, we can also produce machines with special color according to client's request. The size is customized, but should be suitable for the inner size of containers. 1 YRS Anping County Huaguang Wire Mesh Production Co., Ltd. Advantage of chain link fence: Low carbon steel diamond mesh has a heavy galvanized coating to ensure a long life. Chain link wire mesh is separable,you can adjust the length as you need. It is more security to add some razor barbed wire or barbed wire on the top. 3. Start the mass production after getting your payment(deposit). Yishu metal is a reliable ,capable ,responsible manufacturer and partner . Q: what is the shipping cost9 A:We have good cooperation forwarders,we can get best price from them. Alibaba.com offers 136,020 post sales products. About 4% of these are fencing, trellis & gates, 1% are mailboxes, and 1% are silver jewelry. A wide variety of post sales options are available to you, such as fencing, trellis & gates, garden. You can also choose from easily assembled, eco friendly. As well as from metal, plastic. And whether post sales is steel, iron, or aluminum. There are 136,020 post sales suppliers, mainly located in Asia. The top supplying country is China (Mainland), which supply 100% of post sales respectively. Post sales products are most popular in North America, Western Europe, and Domestic Market. You can ensure product safety by selecting from certified suppliers, including 11,855 with ISO9001, 5,295 with Other, and 2,826 with ISO14001 certification.